All this horse wanted to do was join his mates. 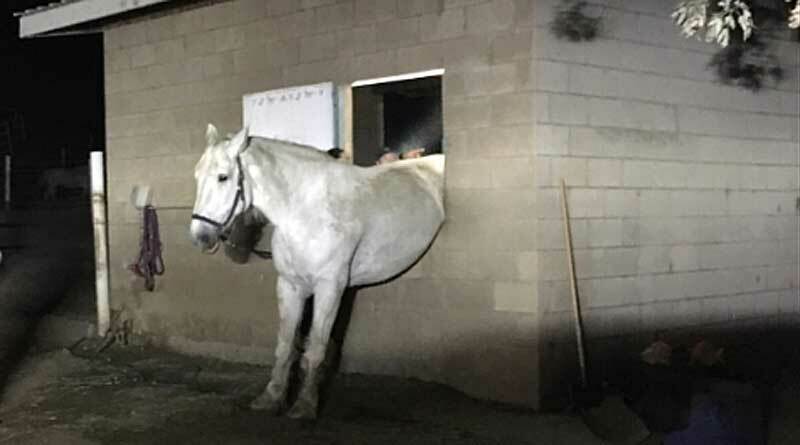 A California horse spied a window of opportunity to join his companions, but his plan went horribly wrong. Firefighters were called out to Somis to rescue him from his ordeal. The horse apparently had fairly typical Saturday night aspirations – to hang out with his mates. To do so, he tried to exit his stable through a opening which had its shutter open and ended up trapped instead. Firefighters with the Ventura County Fire Department large animal rescue team were called out to mid-evening to the 8500 block of Waters Road to mount their rescue effort. “Our team trains just for calls like these,” the department’s public information officer tweeted. It took roughly an hour to free the horse, which was reported to be walking normally after his ordeal. A vet had been called to give him a check-over. ← Riding into the horse’s world: Are you ready for it?